Many people do not know that there is a distinction between the Staffordshire Terrier and the American Pit Bull Terrier. Although they share the Pit Bull genes‚ today they are registered as separate breeds. 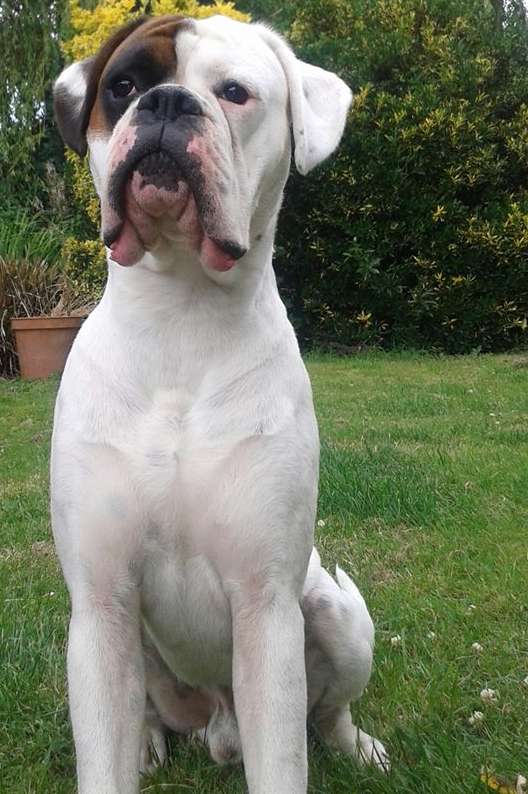 Staffordshire Terriers are often known as AmStaff or Staffy for short. They are originated from the Staffordshire Bull Terrier but with some genetic modifications to give them a bulkier appearance and a bigger head. The American Pit Bull Terrier is said to have also originated from the Staffordshire Bull Terrier. I suppose you could say that both of these dogs are cousins of each other. 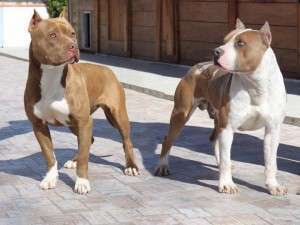 The Staffordshire Terrier is bred for show purposes while the American Pit Bull Terrier is seen as a non show strain dog. There is a great difference in the size of these two dogs‚ the Staffy is a much heavier and bulkier dog than the American Pit Bull Terrier. The Staffie shares a heavier bone structure than its cousin the American Pit Bull Terrier. A male Staffie can weigh up to 90 pounds whereas the male Pit Bull Terrier weighs around 70 pounds. You may find some Pit Bull Terriers weighing more than this, it only means that they have a mix of another dog in them such as a Mastiff. Staffies will do great in canine sports such as weight pulling, Pit Bulls will do well in agility training. 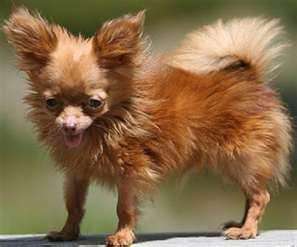 In both breeds the female dogs weigh slightly less than male dogs. Both breeds share a healthy genetics and can live up to 15 years if well cared for. Common diseases affecting both breeds include hip dysplasia, cataracts and heart disease. The Staffordshire Terrier is more prone to heart murmurs and thyroid issues. Grooming is easy on both breeds‚ only a light brushing is needed every week or so. Both breeds are capable of producing five to ten puppies in a litter. Both the Staffordshire and the Pit Bull Terrier are people friendly dogs. It is the dog owners responsibility to keep the dog as the lowest pack member in their family. As long as this rule is followed they will get along with everyone in your household including kids. Staffies and Pit Bull Terriers are both also very courageous dogs and will go to extreme measures to protect their human family. Being an American Pit Bull Terrier owner myself‚ I know that these dogs are very protective of their owners property. These dogs have a high tolerance for pain so you will find some Pit Bulls not even bothered by electric fences. From what I observed‚ females in both breeds are more protective and stay closer to their owners than males. Staffordshire Terrier vs Pit Bull | Which Dog to Get? While making a decision between the Staffordshire Terrier vs Pit Bull, it simply comes down to personal preference. These are both awesome dogs that only knows to love their human owners. Don’t be fooled by the media that says every dog who bites a human is a Pit Bull. Ultimately, any dog is shaped by their human owner and the principles they are raised on. Personally, I very much like the American Pit Bull Terrier compared to the muscle bound build of the Staffy. I also own a piece of history by owing the American Pit Bull Terrier, Did you know that the Pit Bull Terrier served in the military during World War I and World War II? I know of many people who love the muscle bound look of a Staffy more so it all comes down to personal likes. If you are into showing your dog or sports such as weight pulling then get a Staffy. If you just want a loving dog and a family companion, stick with an American Pit Bull Terrier. Both of these dogs are amazing, please spay and neuter your dogs at a year of age to avoid unwanted pregnancies. It is heart breaking to see that so many of these loving dogs end up in shelters or to be euthanized. So if these two breeds were human could one say that the American Pit would be a professional Athlete where the Staffordshire would be massive for no reason like nobody builders? Hel me out of you will. Strong (guarding what is most precious to me a father would only desire the king of dogs, the strongest of dogs. So is all of the mass on the Staffy strength OR exaggerated size with equal strength to the lesser massed Pit Bull?). lol you put it quite right, I think an American Pit Bull terrier or better yet a Labrabull would be great for your daughters. They are both high energy dogs but the Labrabull has a bit mellow personality than a purebred Pit Bull Terrier. My girlfriend and I are thinking of getting a dog, but we haven’t decided if we want an AmStaff or a Pitbull. I’m a college football player so I don’t worry about exercise, but I want a dog who is affectionate and playful. American Pit bull Terriers are high energy dogs, they are very affectionate and playful. They are probably best suited for your lifestyle. I have a puppy that is a mix of these two breeds. He is 10 1/2 weeks old and was the runt of the litter. So I guess I have the best of both worlds. Right now he is sleeping on my lap. He is a sweetheart (when he isn’t biting-gotta love puppy teeth lol). We have had him for 2 weeks and he is learning not to bite and to go to the door to be let out. He is mt first bully dog (he loves to hog covers and pillows). I own the sweetest Staffordshire Terrier. She’s grey with white and a few dark spots on back. We walk a few miles every day, but get Leary around other country pack dogs, so gar we’re good she’s passive, but curious. She’s five years old and mellow tempered. Will she be aggresive while harnessed? We adopted a 6-year-old doggo in July – they told us she is an Amstaff, which seems about right since she’s short and built like a barrel. She is extremely affectionate and generally loves all people. She still protects and barks at the door. She is extremely protective around other dogs and doesn’t do well with more than one other dog in the room and she has to dominate. Does anyone have experience with this? We would love it if she could go to the dog park and play, but we’ve only seen her play one time with another dog, and it was a 3-month old yellow lab. The vet said she’s had several litters in her life, so we think that she’s better with puppies because they’re not a threat. Is it possible to train her to enjoy the company of many dogs at the park? thanks Guys! The apbt Is a better weight puller actually. Are there any really good videos on how to correctly train a two year old Staffy/ Lab rescue . To start …basic obedience and then more advanced. You keep referring to the American Staffordshire Terrior as a “staffy”. That is incorrect. Staffy is a nickname coined to the Staffordshire Bull Terrior. 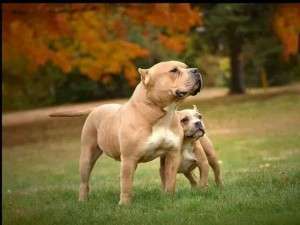 Also, when American breeders thought that bigger was better, they created the American Pitbull Terrior (later adopted by the AKC as an American Staffordshire Terrior) by breeding the Staffordshire Bull Terrior with various bigger breeds to form the APBT which took away from the tenacity and pound-for-pound strength of the dog. Dog fighters noticed after doing so that these bigger dogs (apbt’s) didn’t have the tenacity, pound-for-pound strength, or agility of the Staffordshire Bull Terrior which caused a heavy and widespread backlash in the American fighting rings because of the folly of mixing the Staffordshire Bull Terrior with random bigger dogs. Pitbulls have been labled the pound-for-pound strongest dog in the world but in reality it’s their distant cousin the Staffordshire Bull Terrior (Staffy). The are nicknamed the “nanny” dog according to the American Kennel Club because of their nature of being good with children, similar to the Amstaff an APBT but with even more diligence and protectiveness. In conclusion, they’re all fantastic dogs but the unadulterated Pitbull is without controversy the Staffordshire Bull Terrior. The author of this doesn’t seem to know the difference between a Staffordshire Bull Terrier (Staffy), a American Staffordshire Terrier (AmStaff), and a American Pit Bull Terrier. Douglas where is the love dude?